Product #2403 | SKU BEVT999 | 0.0 (no ratings yet) Thanks for your rating! 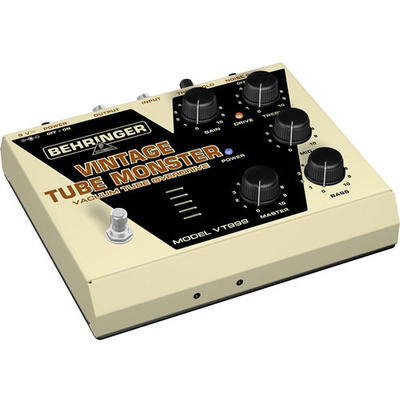 The Vintage Tube Monster VT999 effects pedal from Behringer has that full-tone roar of a tube engine under its hood, letting you take off with anything from warm blues overdrive to heavy distortion. This high-quality stomp box has the warm sound of a hand-selected 12AX7 vacuum tube. In addition, the VT999 offers an integrated and switchable noise gate with adjustable threshold that keeps your sound noise-free. A status LED is included, plus there is a true hard-wire bypass for ultimate signal integrity. With this monster engine, your guitar playing will definitely be kicked into monster overdrive!